What most people don’t realize about SUP-ing in the Gorge is how incredibly diverse the paddling is — from glassy cruises to the best downwind conditions anywhere. My perfect Gorge day starts at our Event Site Center at 6:00 am, with the tunes fired up (Taylor Swift), and 30 kids showing up for Jet Team SUP training. It kicks off with a sandbar run and yoga, followed by a fast-paced paddle workout — feeding off each other’s energy. The rest of the day is a bonus. The common mistake I see Gorge visitors make is not seeing the rest of the Gorge! The recreational opportunities are endless. If there’s a no wind day I’m headed to the river for paddling, or Post Canyon for mountain biking. My most memorable Big Winds customer? Gosh, not easy after 30 years. But Steve Thompson ranks up there. He was in the shop today (late Feb) for some booties. Works hard. Sails year around. Absolutely rips. Super humble and always a friendly smile. It’s a treat to cross paths with him. What most people don’t realize about SUP-ing in the Gorge is you can make it extreme if you want to! Going for a downwind SUP run when it's blowing 30 mph is as thrilling as a 3.0 windsurfing day. My perfect Gorge day starts with a coffee at Ground on the way to a dawn patrol Viento downwind run, then indulging in a turkey and brie sandwich at River Daze before heading for a bike shuttle at the top of Post Canyon. Top the day off with beers on a deck or at the water, and then repeat. The common mistake I see Gorge visitors make is not taking advantage of alternative activities when their first choice isn't doable. If the wind isn't blowing SUPing can be a lot of fun, and if it's blowing too hard for SUPing try a windsurf lesson. If there’s a no wind day I’m headed to my bike. But I can’t share my favorite trail. Secret! My most memorable Big Winds customer? That’s easy. It’s Marvin Curless from Bakersfield, CA. Marvin has been a customer since I can remember, and his enthusiasm for windsurfing is bottomless! What most people don’t realize about SUP-ing in the Gorge is how diverse our riding conditions are — from butter flat slicks to oceanic river swell. My perfect Gorge day is a dawn patrol kite session at the Hatch, breakfast at River Dayz, then a downwind SUP run from Viento to Hood River. Lunch at the Event Site’s Sandbar Cafe, then head to the Marina to kite the wake features. If I’m still standing, I’d foil kite into the sunset, and finish the day with dinner and beers at Pfriem Family Brewing. The common mistake I see Gorge kiters make is launching or landing upwind of windsurfers. Not cool. If there’s a no wind day I’m headed to the White Salmon River for a whitewater SUP, or over to Cascade Locks to SUP surf the Sternwheeler’s boat wake. My most memorable Big Winds customer? That’s easy. It’s Ken Lucas, the Cabrinha Traveling Ambassador. He’s always back from rad surf and snow adventures. I live vicariously through Ken’s travels! What most people don’t realize about the Gorge is that it’s not about the windsurfing, kiting, or SUPing. Its biggest draw is the culture. Life in motion. Outside. Lived in the present tense. Always. The most common mistake I see Gorge windsurfers make is they miss out on easterly winds. 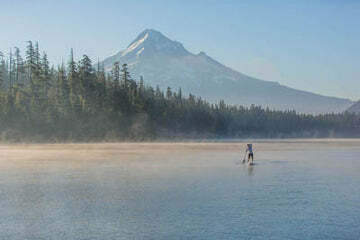 They’re often strongest in the mornings when Hood River is glassy. Just drive 20 minutes west, to Stevenson, WA, and it’ll be cranking. Steadiest winds in the Gorge. If there’s a no wind day, I’m headed to Pacific City, on the Oregon Coast for a surf session. Cute beach town. Cheap digs too, with lots of waves to go around. My most memorable Big Winds customer? That’s easy. It’s Bob Bowditch. I taught him to forward loop in 1997. He was 58-years-old at the time. A grandfather. He landed his first loop in a waterstart position. I can still see his jittery smile, charged with adrenaline. What most people don’t realize about kiting in the Gorge is that even in the peak of the summer, there’s always room on the river to kite uncrowded stretches of water in epic conditions. My perfect Gorge day is in the spring. Fresh snow on Mt Hood in the morning. Then a kite session just east of Hood River, followed by dinner at Sushi Okalani's, and drinks and music at River City. The common mistake I see Gorge kiters make is rigging too big. Canyons that flank the Columbia River funnel the wind. It packs a punch! If there’s a no wind day I’m headed to the mountains or the coast. My most memorable Big Winds customer? That’s easy. It’s Jack Hwang. He spent last summer learning to windsurf with his three boys. From day 1 in the Hook to sailing across the river — helping people like Jack is is what I love most about my job. What most people don’t realize about the Gorge is the season doesn’t end Labor day weekend. September and October are beautiful, with plenty of warm weather, wind, and uncrowded water. My perfect Gorge day starts with a Hatchery dawn patrol windsurf session, then home for breakfast to plan the rest of the day with family. If there’s a no wind day I’m headed for my mountain bike, followed by a SUP session with my kids to rinse off. My most memorable Big Winds customer? There have been so many. But if forced to pick one it’s Creston Shaw, a seed farmer from eastern Oregon that took up windsurfing in the late 80’s to do it with his teenage grandsons. He was about 65 at the time, and windsurfed well into his eighties. Nice as they come, and tough as nails. What most people don’t realize about the Gorge is it’s not just for experienced windsurfers. Big Winds teaches over 1000 people to windsurf every summer. Most are first timers. Our consistent winds let us offer lessons almost every day. My perfect Gorge day starts with my son running into our room having slept through the night followed by yoga at Pure. Then I’d fuel up with a Turkey and Brie at Riverdaze Cafe, then off to Post Canyon for a mountain bike ride with my wife, leading to an afternoon SUP downwind run from Viento. Cherry on the top is dinner at Brian's restaurant with Baja margaritas, and great friends. Living the dream. The common mistake I see Gorge visitors make is not carrying enough change for the $1 bridge toll. If there’s a no wind day I’m headed the trails. See my "perfect Gorge day." My most memorable Big Winds customer? That's easy, it's David Kincaid. His smile, jokes and positive glow made my Saturday mornings. I looked forward to seeing him walk in the door. He is missed.